﻿ Real Madrid 3-2 Sevilla (AET). The sweet reward for never giving up! 09.08.2016 » Real Madrid 3-2 Sevilla (AET). The sweet reward for never giving up! 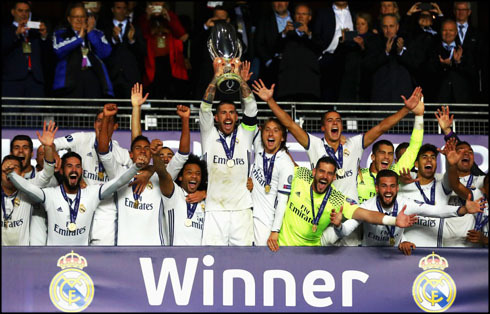 Real Madrid got the better off Sevilla this Tuesday night in Trondheim, as they beat the Andalusian side 3-2 in extra-time and took home the first silverware of 2016-17. Marco Asensio, Sergio Ramos and Carvajal scored the 3 goals that allowed Madrid to lift the 3rd UEFA Super Cup trophy in the club history. First trophy of the season on the line and the Merengues delivered! Zinedine Zidane had a lot of his usual players unavailable for this clash and was forced to resort to some of the new faces in the roster for this season. Nevertheless, Real Madrid proved to be up to the task as they went on to beat Sevilla 3-2, and it would be precisely one of the new faces who got the honor to break the deadlock. Marco Asensio with a stunner early in the first half, Sergio Ramos with a last-minute equalizer at the end of regular time and Carvajal with the heroic winner just a few minutes before the game was about to go into a penalty shootout, contributed to another memorable night in the Merengues' history. With the BBC (Bale, Benzema and Cristiano Ronaldo) and several other key players still unfit to be picked into a starting eleven, Zidane had to rely in several players who are probably going to be relegated to 2nd choices as the season unfolds. 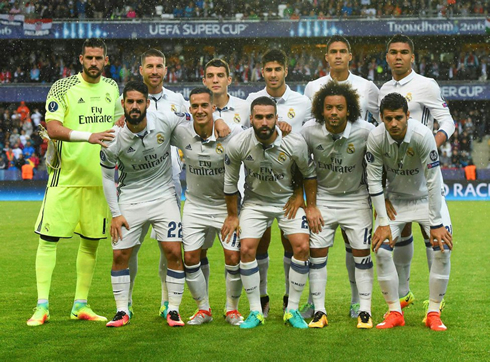 Kiko Casilla was the chosen goalkeeper, guarded by a back-four formed by Marcelo, Sergio Ramos, Varane and Carvajal. The Merengues midfield was packed by Casemiro, Kovacic and Isco, while upfront, almost every attacking duty was carried through by Lucas Vázquez, Marco Asensio and Álvaro Morata. The opener was one of those moments that even Bale or Ronaldo would have been proud of, had they been the goalscorer... And that pretty much says it all! Marco Asensio, one of Madrid's exciting new faces for this season, delivered the world his "resumé" with a spontaneous and stunning long-range strike, sending the ball straight into the top left corner of Sevilla's goal. What a way for the 20-year old to make a statement! In the second half, Madrid kept being slightly more superior, creating more chances and threatening in multiple occasions to gain the upper hand for a second time in this game. However, it ended up being Sevilla taking the lead, after earning a penalty-kick on a Sergio Ramos controverse foul inside the box. Konoplyanka walked on to the spot and converted this golden chance to put Sevilla in front for the very first time in this game. Things weren't looking good for Madrid and they had nearly only 20 minutes left to do something about it. Fortunately and once again, the Merengues were able to rely on their captain Sergio Ramos, as he delivered Sevilla the costy blow of the equalizer already inside the 3rd minute of added time. The Spanish defender finished off a cross to the far post with an open net header and the game would move on to extra-time a few minutes later. With the 2 teams quite fatigued coming into extra time, Real Madrid appeared to be the fittest side on the pitch and got rewarded for never stop believing they could win this game without taking it to penalties. And the hero of the night turned out to be one of the least likely players on the field. 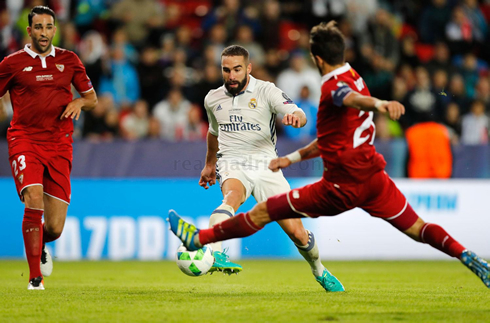 It was the right-back Daniel Carvajal who struck the final blow in this final, after picking up the ball still near the half-way line, slaloming between two Sevilla opponents just before beating Sergio Rico and setting the final score in 3-2 favouring Real Madrid. There wasn't much time left for Sevilla to try to get back in the game and the final whistle was blown moments after. Zidane won his second title as Madrid manager and the club added his 3rd UEFA Super Cup to its trophy room. Attackers: Lucas Vázquez, Asensio, Alvaro Morata. Cristiano Ronaldo next game for Real Madrid is the last pre-season friendly of the season for the Santiago Bernabéu Trophy, on August 16 of 2016, against Stade de Reims. You can watch Juventus live stream, Real Madrid vs Stade de Reims, Middlesbrough vs Stoke City, Manchester City vs Sunderland, Viking vs Arsenal, and Everton vs Tottenham, all matches provided from our sports free game pages.